A typical visit, from arrival to departure, lasts around 90 minutes. Please be sure to arrive on time for your booking. Should you experience any delays or need help with directions on the day of your visit please inform a member of the Centre of the Cell staff on 020 7882 2562. This is particularly important as we often have one of our scientists booked as a STEM Ambassador for the Pod sessions and we can notify them if a session is due to start late. If you are more than 20 minutes late for a session and we have another booking scheduled for after yours, your session time may be shortened. If you are more than 40 minutes late it may not be possible to run your session. On arrival, groups will be met in the building reception by Centre of the Cell staff. Teachers should bring a list of all pupils present or, if this is unavailable, sign in all of their students on arrival. This list can be left with the Centre of the Cell staff. Toilets are available at reception, down the corridor to the left of the reception desk. Please ensure that students using the toilets are accompanied by an adult, and that those remaining in reception are also supervised. At the stated time for your visit, you will be met by our Explainers. In addition, we also aim to have at least one medical or dental student and / or a scientist accompany each visit. The Explainers will greet everyone, introduce themselves, and welcome you to Barts and The London School of Medicine and Dentistry, and to Centre of the Cell. They will let the students know what to expect of their visit, making sure that everyone is excited and eager to go! Fire evacuation procedures and other behavioral expectations will also be given. The group will then proceed to the cloakroom to drop off their coats and bags, and will then cross the bridge to Centre of the Cell’s Pod. Centre of the Cell is located inside our distinctive orange Pod suspended above the laboratories in the Blizard Institute in Barts and The London School of Medicine and Dentistry; visitors will be able to see research scientists at work as they enter the centre. Once inside, visitors will learn about the amazing world of cells, the human body and the latest medical research. The experience includes curriculum-linked interactive games based on cell biology and research happening at Barts and The London School of Medicine and Dentistry. These games utilise the latest digital technologies. Many feature footage of scientists describing their work, and involve games based on that research. 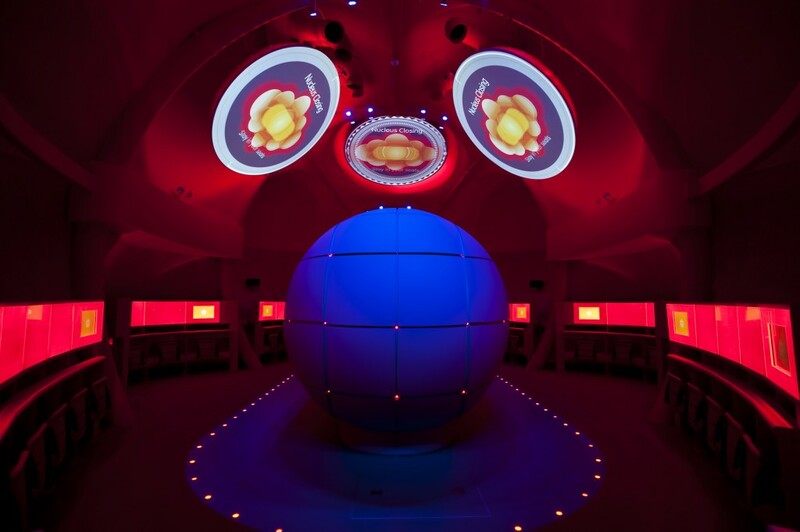 These interactive games are enhanced by the films projected onto the ceiling of the Pod which introduce the concepts of cell biology and medical research. Visitors can also enjoy microscopes and specimens from the Pathology Museum, such as a human brain, learn about careers in cell biology, and debate the ethical issues surrounding medical research. As well as our trained Centre of the Cell staff, we aim to have at least one medical or dental student and / or scientist join each visiting group to enhance the learning experience and to answer visitors’ questions about science and careers. At the close of the show, groups are taken back to the cloakroom to retrieve their belongings. Our gift shop will be open at the end of the visit with a range of items available from 30p to £16.50. The group will then be led back to the main entrance, where there will be an opportunity to ask any questions they may have following their visit.